Things have gone well for 18-year-old Jadon Sancho since swapping the Premier League for the Bundesliga in 2017, and the winger says he has one man to thank for the decision - American teammate Christian Pulisic. Sancho left Manchester City in search of first-team football, and has made a huge impression since settling in Germany, scoring seven and assisting 12 in 27 appearances so far this season, and establishing himself as one of Europe's top young talents as Dortmund sit seven points clear atop of the Bundesliga. 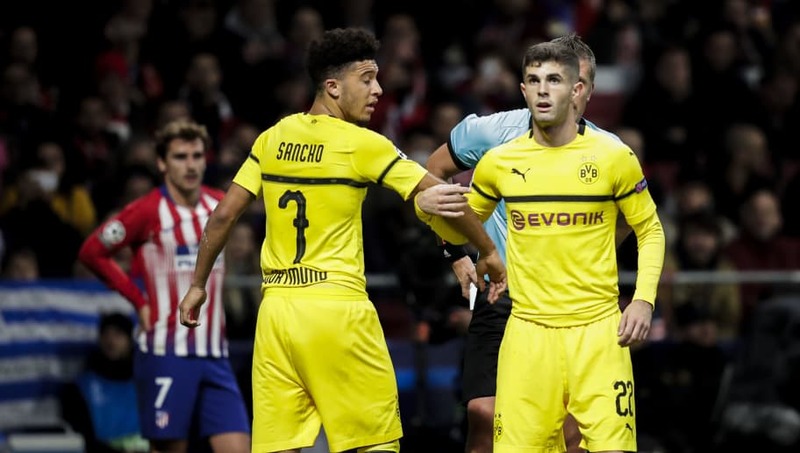 His career trajectory paralleled that of Pulisic, who came over from America to link up with ​Dortmund's youth sides aged just 16 in 2015, and Sancho says the similarities between their respective explosions onto the scene are no accident. "The club had shown with a player like Christian Pulisic that they were going in the right way, playing youngsters and giving them a chance," Sancho told ​ESPN. "He came from the same situation as me, leaving his family behind. 😮 "He can do things I have rarely seen." "He was so young, and he was brave enough. America is a lot further away than England and he's taken a bigger step than I have done. How he's handled that, what he does on the pitch, his mentality towards football, it's just crazy. The passion he has. I admire him." He continued: "He's an outstanding player, I really do look up to him. "Him going away from home shows that you have to do things to get out of your comfort zone, sometimes. "I feel it's worked for him and it's working for me now, because we're both staying focused and keep training hard." Pulisic's displays have earned him a move to Chelsea in the summer, after the Blues agreed a £45m deal earlier in the season, and there has been much speculation that Sancho's career could follow a similar path in the near future. Controversially, ​Manchester United have recently ​emerged as serious suitors, as the club reportedly look to add a quality right winger to their ranks in the summer, while he has also been fleetingly linked with ​Liverpool and a return to ​City throughout the season.